The Magic Roundabout Milongas organises Argentine tango dance events for people who like traditional tango music. Five years ago I became a part of the Magic Roundabout Milongas team. Since then there have been Magic Roundabout (MR) Milongas in Bristol (Almondsbury), Tidenham Chase, Kington Langley and Lydney. We believe that the details make a difference to your dance experience. At the events you’ll find sprung wooden dance floors, excellent sound, cabeceo friendly lighting, experienced DJs, free tea and coffee and free parking. You’ll find more information about the venues further down. More important our milonga dates for 2019! 6 hour milongas with 2 tango DJs and occasional some talks before. 4 hour milongas with 1 or 2 tango DJs and Tango Marketplace. 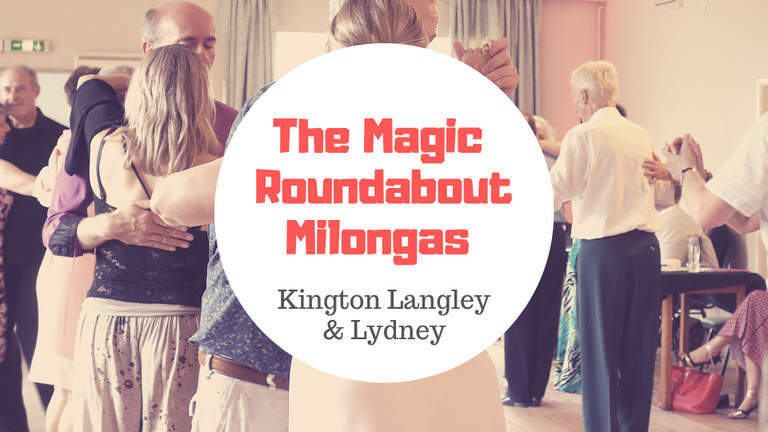 The Magic Roundabout Milongas in Kington Langley are organised quarterly at the Kington Langley Village Hall, near Chippenham, Wiltshire. Kington Langley Village Hall, Church Road, Chippenham. SN15 5NJ. This is a lovely hall, approximately 20m x 9m, with sprung wooden floor said to be one of the best dance floors in the area. It has a separate shoe changing area where you can leave coats and outside shoes and a kitchen area where you can help yourselves to hot and cold drinks and light refreshments. Easy access from the M4 motorway, Junction 17. The nearest train station is Chippenham, 2.5 miles from the venue. A taxi ride is about £8 each way. The Magic Roundabout Milongas in Lydney: The 4 hour Sunday Service Milongas & Tango Marketplace are organised monthly at Watney Hall in the Forest of Dean. Watney Hall, 3 Hill Street, Lydney. GL15 5HW. The place has a sprung wooden dance floor, excellent sound, cabeceo friendly lighting, experienced DJs, free tea and coffee and free parking. Very easy access from the A48 by car. The nearest train station is Lydney which is approximately 1 mile from the venue. Newsletter – Sign up to be up to date!